Coffee, tom yum, goma (black sesame), matcha (green tea), charcoal, yuzu…inventive flavours come and go like wildfire in the F&B scene. Lately, salted egg yolk and cheese are all the rage as the public can't get enough of the savoury flavours. Since we had friends and family who weren't clued in on the saucy trend, what better way to induct them than bringing them over to Crab Factory, literally letting them paint the town table red with the resto’s Happy Meals. Depending on the size of your dining party, the value for money package meal deals let you chow down on crabs and seafood starting with Crab Lover Shiok at RM149.70++ per set, enough to feed 2-3 persons. This set consists of 2 pieces of XL Meat Crab, King White Prawns, Squid, Mussels, Hamaguri Clams, Corn, Broccoli, Fried Mantao and Shallot Rice with a choice of sauces: Signature Southern Bang, Jamba Jamba, Garlic Butter, Creamy Lemak or Salted Egg. Both the Southern Bang and Jamba Jamba come in different spicy levels: mild, medium or O’l Crab-Death Valley (add RM5). We chose to go with the Crab Lover Party (RM299.50++ for 4-5 pax) which comprises 2 pieces of XL Meat Crabs, King White Prawns, Squid, Mini Lobsters, Hamaguri Clams, Freshwater Prawns, Mussels, Corn, Broccoli, Fried Mantao, Fried Chicken Wings and Shallot Rice with medium hot Southern Bang Sauce. 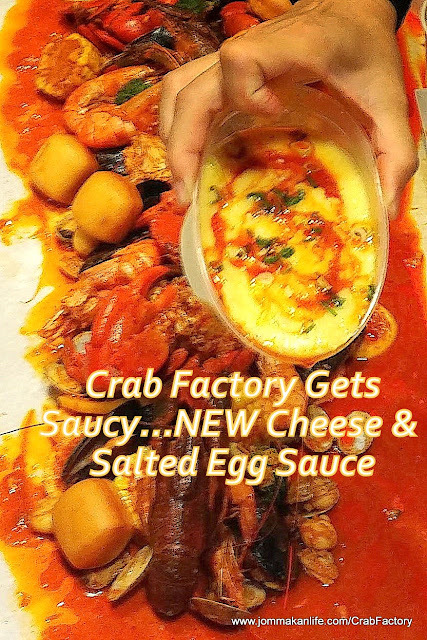 Just to satisfy our curiosity, we also asked for Crab Factory’s new Cheese Sauce (RM6.90++) to be poured onto the seafood. It proved to be a good choice as we discovered the rich creamy cheesy sauce was finger-licking divine with the feisty hot sauce. We relished the second saucy option of Salted Egg Sauce with 1 piece of XXL King Crab with corn, potato and fried mantao (RM298++). Surprisingly, the salted egg yolk accent was kinda muted but that wasn’t necessarily a bad thing since it won’t outshine the pricey crab. Try the Creamy Lemak Sauce if you prefer non-spicy sauces. It should appeal to local palates as the sauce is reminiscent of Malay-style 'masak lemak' minus the fiery hotness. Besides Meat Crabs (from RM123++ upwards), the resto has French Brown Crab (RM21++) too. Other notable imported seafood worth sampling include Jumbo Japanese Sweet Prawns (500g, RM99++) and Mini Lobster (RM85++) with your choice of sauces and bag buddies, side dishes like Squid Tentacles, Chicken Wings, Waffles, Potato Wedges, etc. For reservations at CRAB FACTORY SS2, call tel: 03-7865 5850. Address: 21, Jalan SS2/64, Petaling Jaya, Selangor. Visit http://www.crabfactory.com.my for more info. NEW OUTLET: CRAB FACTORY JB, Little Paris, Mount Austin, G14, Jalan Jaya Putra 1/1, Bandar Jaya Putra, Johor Bahru, Johor. Tel: 07-351 4062.